The Fellowship was fortunate enough to obtain a copy of THE BIONIC MAN #17 from Dynamite Entertainment. The story is by Arron Gillespie, with art by Ed Tadeo, colors by Thiago Ribeiro, and lettering by Simon Bowland. Steve Austin is sent into Libue, a country in the middle of a rebellion against the dictator Mukhtar Hadad. His mission: to find and disarm the stash of nuclear missiles that Hadad has threaten to use against the United States if they got involved in the battle. On his way to Libue’s capital, Steve notices a group of rebels pinned down by a group of soldiers led by Hadad’s son. He decides to aid them instead of completing the mission, but is he doing more harm than good? And are Hadad’s soldiers prepared to battle a one man army? This is a solid, action-packed start to a new story arc. Gillespie’s script hits the ground running and doesn’t let up. Tadeo’s art is solid and very impressive. I definitely want to see more of his work. I have enjoyed this book from the beginning and it seems to get better with each issue. 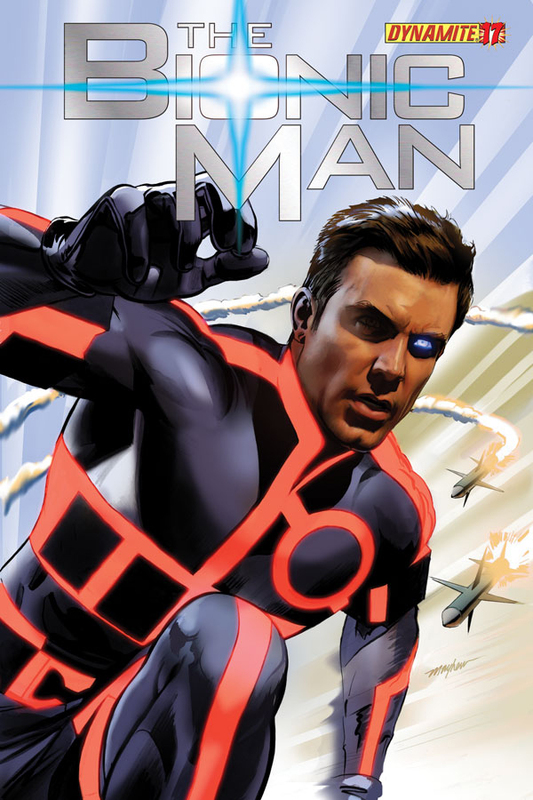 THE BIONIC MAN #17 is in stores now and available at www.dyamite.com.